Importing ugui proxy gives me compiler error. Since I havent touch playmaker since 2016, would like to make sure if its still the way to go for ugui or if there is another way nowadays. it is indeed still the way to go. Did you get them from the Ecosystem? What compiler errors are you getting? oups, I'll sort it out for tomorrow. Just a question. Why is this not coming with playmaker by default? Im surprised that still you have to go through external actions to make whats default on Unity now to work. Also the custom actions are provided by the community. basically, the problem is the following, to support everything, it would mean thousands and thousands of actions and that would really start to affect compilation time, so it's actually better to have external resources and only bring in what you really need for a particular project. 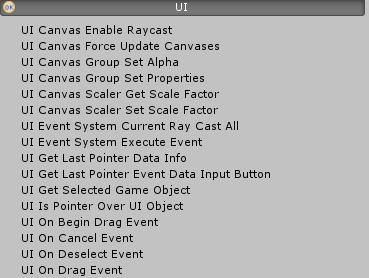 Each project has it's own needs, not everyone is using the Unity UI, or mecanim, or pathfinding, etc etc. It's a tricky call, I agree. Do I need uGUI proxy in 2018.3 and latest version of Playmaker or playmaker is now capable of interacting with UI without uGUI proxy using UI actions[/url]? No, you don't need them, PlayMaker has them now, however the proxies component itself brings more power then PlayMaker built in System events for UI, so if you are used to uGui proxies, then you can simply get them and ignore the actions.